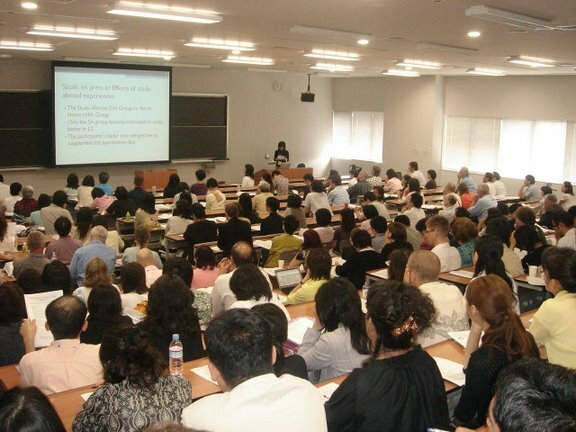 The 2009 Symposium on Second Language Writing was a great success. About 400 people attended the Symposium, with 15% coming from outside the United States (not including many international students and scholars currently affiliated with U.S. institutions). The participants represented 21 different countries, including: Australia, Brazil, Canada, Colombia, Greece, Hong Kong, Japan, Korea, Malaysia, Mauritania, Mexico, Poland, PR China, Singapore, Spain, Sweden, Taiwan, Thailand, Turkey, the United Kingdom and the United States. Photos from the Symposium are available at: http://flickr.com/gp/pmatsuda/218rT6. 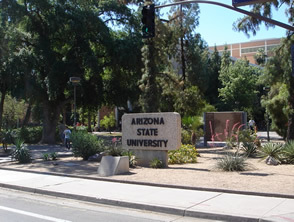 The 2009 Symposium on Second Language Writing will take place in the Memorial Union at Arizona State University on November 5-7, 2009. With the theme, "The Future of Second Language Writing," this year's Symposium aims to provide an opportunity to contemplate the future of this young and vibrant field in the presence of well-established, internationally known researchers and teachers as well as relatively young teachers and researchers who bring new energy and enthusiasm to this growing field of inquiry. The 2009 Symposium will feature distinguished plenary speakers who are internationally recognized experts in second language writing, including Carole Edelsky, Mark A. James, Ann M. Johns, Mark Warschauer, and Gail Shuck. A series of invited colloquia will address various issues concerning the future of the field. Some of the topics include: the future of second language writing; assessment; EFL writing in schools; genre; defining "generation 1.5"; and the interface between second language acquisition and second language writing. Concurrent sessions will address a wide range of issues in the field of second language writing. There will also be two half-day workshops: "Treatment of Error in Second Language Writing" led by Dana Ferris and "Plagiarism vs. Legitimate Textual Borrowing" led by Christine Tardy. The Symposium will conclude with a message to the new generation, a special session featuring well-respected, seasoned members of the field. The Symposium on Second Language Writing is an international conference dedicated to the development of the field of second language writing--an interdisciplinary field of specialization that draws from and contributes to various related fields, including applied linguistics, composition studies, modern language studies, education, rhetoric, and TESOL. Founded in 1998 by Tony Silva and Paul Kei Matsuda, the Symposium has been bringing together second language writing specialists to discuss key issues and concerns in the field. Since then, the Symposium evolved into a biennial international conference, attracting second language writing researchers and teachers from around the world. From the beginning, the Symposium has been attracting second language writing researchers and teachers from all over the world. In 2007, the Symposium was held outside the United States for the first time, making it truly international. The 2007 meeting also made the Symposium an annual event. Bedford/St. Martin's Press for sponsoring the Opening Reception and for providing complimentary copies of Second-Language Writing in the Composition Classroom. Assessing Writing and Elsevier for sponsoring the invited colloquium on writing assessment, organized by Deborah Crusan and featuring Liz Hamp-Lyons, Sara Cushing Weigle, Ed White and Deborah Crusan. Writing & Pedagogy and Equinox for sponsoring the invited colloquium on technology and second language writing organized by Bryan Smith and featuring Martha Pennington, Greg Kessler, Randi Reppen, Elena Cotos, and Bryan Smith. Parlor Press and David Blakesley for sponsoring the plenary talk by Ann M. Johns. Deborah Crusan for sponsoring two graduate student participants.